Medical grade laboratories use testing equipment that generates large amounts of heat. In order to keep the equipment in optimum testing condition cooling is required. Diagnostic imaging labs are specifically affected by heat. Machines used to take high precision images of the bodies internal structures such as MRI, CAT, Ultrasound, and X-ray machines require massive amounts of energy. The more precise the image is, the hotter the equipment becomes. When the heat generated by this type of equipment is not cooled properly the equipment calibration and the results are unreliable. In order to preserve the equipment longevity and provide reliable images chillers are used to prevent overheating. 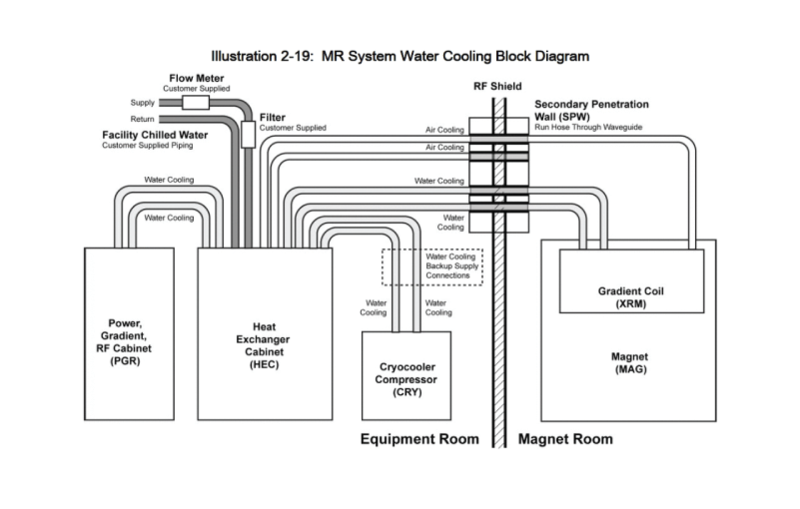 The diagram below provides a diagram of a typical medical imaging cooling system. When it comes to biological sample testing equipment lasers are often a key component. They are used to analyze urine, blood and other biological materials for their chemical compositions. The integrity of the sample and laser quality must be ensured to provide accurate information. The cooling equipment is used to keep the components and laser at optimum operating temperatures. Laboratory refrigerators or freezers are required to store biological or chemical contents at precise temperatures for use in research, and in the case of flammable chemicals it is essential that there is no possibility of the refrigerator being a source of sparks. Weather the refrigerators are holding testing materials or actual specimens they must be able to maintain stable consistent temperatures.